Attended by delegates from different five provinces, the National Council session of the Movement Somos+ was held yesterday. The meeting lasted from 10:00 am to 5:00 pm under normal conditions. Some of the main topics discussed were the consolidation of national and territorial structure, communications, internet access, regulatory documents, membership management, internal democracy and transparency, among others. Self-education had a prominent place in the discussions as well as the need for all members to be well informed. The representatives also received all the financial information of the organization and had access to its updated accounts status. Similarly, the importance of joint work between the members living inside the country and those who reside abroad was analyzed, whose work is being carried out in the consolidation of an international platform which provides the necessary coverage for the work in Cuba. On the day itself the National Coordinator of the Movement was elected for this current phase we have called foundational. Manuel Diaz Mons will serve under this role until the General Elections which are taking place next year and will determine the whole leadership structure for a period of four years. The council also supported the initiatives being carried out along with several organizations of the civil society in order to route proposals for a new electoral law, associations and constitutional changes. On whose roundtables we are directly participating. The activity of self-education at the meeting was conducted by the Doctor of Laws Wilfredo Vallin, who gave to the participants an introductory lecture on topics related to civil rights, based on the existing laws in the Country. 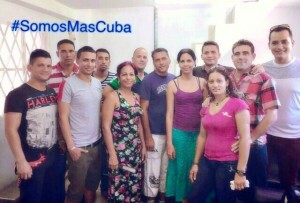 Under unanimous request from the Council, the Doctor himself, who chairs the Independent Law Association of Cuba, agreed to provide advice to our movement in order to submit record of registration in the associations of the Republic of Cuba, a procedure that could take place in the course of this same year. The founder and president of Somos+, Engineer Eliecer Avila thanked the attendees for their decision to commit themselves to the future of Cuba and its people, from a position where the seriousness, intelligence, perseverance, knowledge and respect are the keynotes to the success we definitely expect.